This version of our famous Amana Bone-In Ham is mildly cured, fully smoked and has just enough fat to seal in the juices. At 4 - 6 lbs., it is the perfect size for four to five people. Simply heat and enjoy. And the flavor doesn't stop there. Use the bone and left over bits for making soup. Delicious! Ham was certainly delicious and we thought it was reasonably priced. Shipping too was timely! We gave your Amana Li'l Smoked Bone-in-Ham to my sister's family for Christmas and they said it was the best ham they ever receive! I had been sending hams from different companies for a number of years and decided to try yours. I will be sure to order from Amana again, as they were so pleased and said it also made the best ham and bean soup. Thank you Amana. my what a swell ham. the size is perfect and yields so much eating enjoyment. very tasty and will feed lots of hungry guests. the bone will cook up great in a big pot of bean vegetable soup. Amana Response: Hi Ann, Thank you so much for letting us know. Every ham is different, but we hate to hear about a lot of waste. We do love the flavor, too! I will report this to our production manager. Please email or call us if you have any other questions. We hope to serve you again in the future with our Amana Hams! Our ham and beef sticks arrived in time and perfectly packaged. We've ordered twice now since our initial visit to the store during a cross country road trip. We are never disappointed. The ham is always delicious, and the beef sticks are seriously addictive!! I have sent a ham to my brother and his family for years. They are always happy to get it for the holidays. A nice reminder of Iowa. 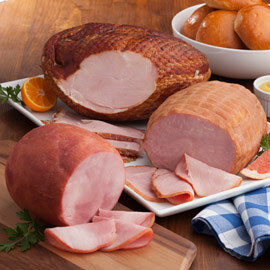 Amana hams are the best hams Ive ever had. My holidays and special occasions ALWAYS include an Amana ham on the table! Thank you Amana for your fabulous customer satisfaction, from ordering to eating! I ordered my bone-in ham at the last minute as a gift for my parents. I selected Amana because it was located in Iowa and I am familiar with Iowa pork. They were so excited to receive the ham. Since I ordered a little bit late, I wasn't sure it would arrive before Easter. No reason to fret. It was in TN in plenty of time. My Mom described it as perfect. They had ham for Easter, ham sandwiches, and used the bone for bean soup. What more could a person ask for. Thank you!!! I ordered 2 small hams and they were delivered with in 2 days. I wish that they would include easy to read heating instruction, the one on the package is hard to read. It arrived quickly and was perfect for 1 person for a great Thanksgiving dinner with plenty of leftovers! Quality ham and not crazy salty with a ton of fat! Lean and delicious! I could not have asked for better. Thank you Amana! You are the best! Forget that Honey baked junk! This ham is so delicious. It is just right size for small gatherings. It also is good if you want ham for two with severval dishes for the week. Great bone for ham and beans. Thank you once again for your service and great product. Amana Response: Thank you, Brenda! We always love sending you our Amana Li'l Smoked Bone-in Ham! I have tried other brands and been disappointed. Then I regained my senses and returned to Amana. I have never been disappointed with any of my purchases. This is the 15th year, and the 23rd ham I've purchased from Amana. Your commitment to quality is why I keep coming back! as always, the very best. Amana Response: Thank you so much! We always enjoy sending you our Amana products! Perfect for 2 - 4 persons. It's become the only ham I like. I order this little ham every year for the snacking that goes on when my family is here. Great to make sandwiches or ham & eggs. Great flavor, not too salty. Nice size for the 4 or 5 people at Thanksgiving who didn't want turkey. Just the perfect ham for ham & eggs, ham sandwiches, and ham dinners. The Lil' bonein ham is just the right size for 2 of us. We have several meals and sandwiches off of it and the bone for beans! Love It as always!! As always, the ham and bacon taste fine. We were, however, concerned it arrived w/o dry ice. Amana Response: Hi David! Thanks so much for your continues business! 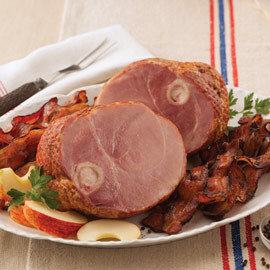 Our smoked hams and bacon travel great without any dry ice. We do ship so that our products arrive in 2 days in top shape for you to enjoy. Was a great treat for Christmas. Presentation was excellent. Definitely will order again. I love the Lil Bone in Ham. It was just enough for the group I had for Christmas dinner. Everyone raved about it. Best ham there is !!!!!!! We will have our ham on Christmas Day as is our tradition. As a person who does not have family to celebrate holidays with, I try to treat myself to something special without having a huge amount of left overs. This ham was delicious on Thanksgiving and equally so on the following days. A managable amount for one or two people, but enough to feed more. This ham is great for a family of two. You can have multiple meals on it. It's even enough for a 4 person dinner party. Scraps left make a fine pot of beans since you have the bone.